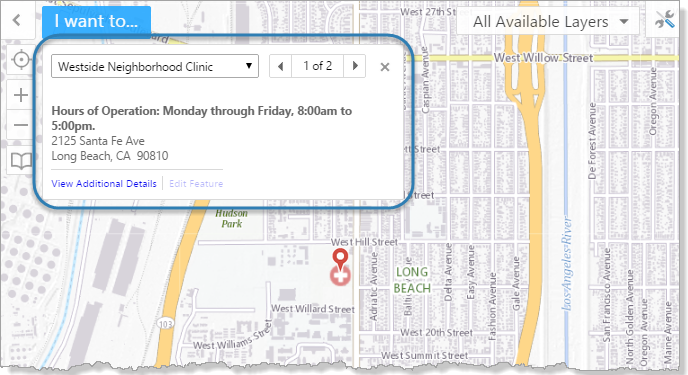 Map tips are pop-up windows that appear on the map when the user clicks on the map. If there are spatial features where the user clicked, the map tip contains information about the features. The features can belong to the same layer, or different layers. Map tips can appear at a fixed location on the map (fixed-location map tips), or at the location where the user clicked (callout-style map tips). Fixed-location map tips appear in the top left corner of the map by default. The map tip's currently selected feature is either marked with a pushpin or highlighted on the map, depending on the feature's geometry. In the screen capture below, the feature is marked with a pushpin because it is a point. Callout-style map tips point to where the user clicked. The HTML5 Viewer uses fixed-location map tips by default. You can configure HTML5 viewers to use callout-style map tips instead of fixed-location map tips. For instructions, see Callout-Style Map Tips. Header: The header contains the Feature Label, as well as components that allow the user to browse the features when more than one result is returned. Main Content: The main content area contains the Feature Description or Feature Long Description. Footer: The footer contains hyperlinks to related information and tasks. Enable map tips for the layer. The layer must belong to a dynamic map service. Follow the instructions given below to enable map tips. For performance reasons, map tips are disabled by default for most types of map service. KML and GeoRSS layers are exceptions—map tips are always enabled for GeoRSS and KML layers. Configure the header and main content that you want to show in the layer's map tips. For information, see Feature Descriptions. 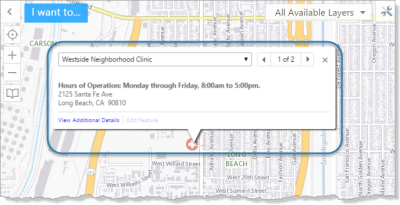 Configure map tips in each of the site's viewers. For instructions, see Map Tips Settings, MapTips Module, and Context Menus. You can use batch editing to enable map tips for all the layers in a map service or folder. Map tips are always enabled for KML and GeoRSS layers. You cannot disable map tips for KML and GeoRSS layers. If the layer is in the Layer List, you can also enable map tips on the Layer List tab. Position the pointer over the layer. Select the down arrow . Select the Show Map Tips checkbox. Map tips are enabled for the layer.